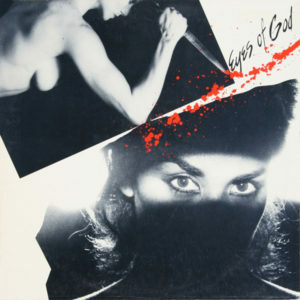 A few months ago, a friend and fellow DJ turned me on to Eyes of God, a four piece San Franciso-based darkwave band, filled with heavy guitars, blaring saxophones, powerful female vocals, and religious lyrics. Little information was available on the net, and at the time, it seemed as if the band only had the one release. The 12” I was originally given has also been uploaded on A Viable Commercial, one of the best blogs around these parts. That particular 12” was released in two formats, with different covers but the same basic track listing, likely released as a label cash-in. However, I stumbled upon what I believe to be the band’s only other release, a debut 12” dating from 1984 and containing four proper studio tracks (not remixes). Naturally, I freed it from the confines of the dollar bin and am pleased to upload it for your listening pleasure. This entry was posted on March 9, 2010 at 5:13 pm and is filed under 1980s, 1984, darkwave, eyes of god, san francisco, synth, US . You can follow any responses to this entry through the RSS 2.0 feed You can leave a response, or trackback from your own site. This is exciting! The singer sounds (and looks) Italian, which reminds me of other great bands from that time like Krisma and Art Fleury. Thank you for sharing! Any chance for a better quality of a larger picture?? There is another album out there. Just heard both of them today. Im sorry I cannot remember the name. But the cover color was kind of beige, with a cross on the front with a female looking through it. The eyes are noticeable. On the back theres a name of a song and some symbols at the bottom left. One is a pentagram, one is a celtic cross. Thats all i kind of remember. Cover looks interesting! Downloading now.